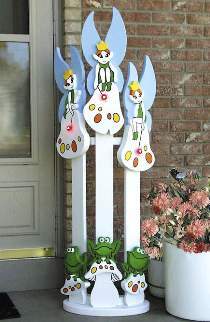 Signal the arrival of spring with these picket pixies. The pickets look like a garden of giant mushrooms. The tips of the pixies' wands are illuminated with a red light bulb. All patterns drawn FULL SIZE, made from 3/4" and 1-1/2" stock. Order hardware below. Picket Pixies Hardware includes a Three Socket Wiring Harness, 3 red bulbs, and 3 pairs of yellow eyes for the frogs. Project plan, wood and paint are not included.